Amid the latest scandal, one question rises above the rest: How could anyone be so stupid? 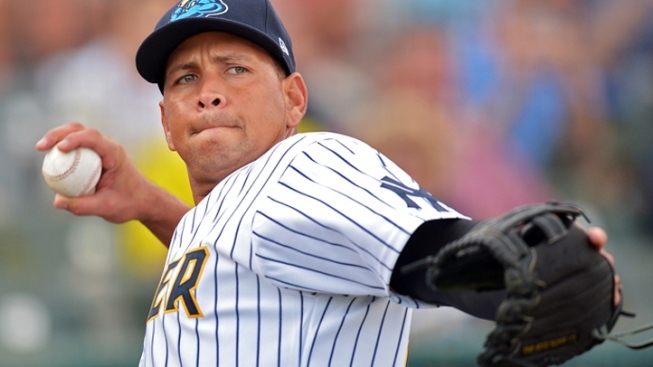 Alex Rodriguez #13 of the New York Yankees warms up before a rehab game for the Trenton Thunder against the Reading Fightin Phils at Arm & Hammer Park on August 3, 2013 in Trenton, New Jersey. Fifteen years ago this summer, Mark McGuire and Sammy Sosa put on the greatest show in baseball, slamming homer after homer, as far as the eye could see. But the sunny season of Mark and Sammy turned out to be an illusion. Now, another storm bodes for baseball, with news Monday of a hall-of-shame list of suspensions – led by New York Yankees third baseman Alex Rodriguez, who reportedly is expected to appeal his penalty in the long-brewing performance enhancement drug scandal. The suspension of 13 players raises many questions. But one rises above the rest: How could anyone be so stupid? How could anyone even think of dabbling in banned substances after the sickening circus of McGuire, Sosa and others testifying before Congress in 2005? After the Hall of Fame ballots that go unmarked, year after year, for McGuire, Sosa and other tarnished superstars – including all-time home run leader Barry Bonds? After the doping stories that long dogged – and eventually brought down – disgraced cycling champ Lance Armstrong? Rodriguez is displaying an Armstrong-like arrogance with his reported plans to play as he appeals his suspension. That's his right. But he risks further sullying both what's left of his reputation and the game that made him rich, if no longer beloved. The next time he steps onto a big-league diamond, Rodriguez will do so as an accused cheat. Part of baseball’s allure, from its earliest days, has been offering an even playing field, a place where talent and hard work can make you the idol of millions. But too many times, for too many periods, that’s proven an illusion, too. The National Pastime didn’t even begin to earn that vaunted nickname until 1947, when Jackie Robinson broke the insidious color line. Thanks to the recent movie “42,” new generations of fans have seen how Robinson began to redeem and reshape the game – one, that in its latest state of dishonor, doesn’t seem worthy of his legacy. Robinson wasn’t a major home run hitter, but his hard-fought greatness was no illusion. He scrapped his way around the diamond, one base at a time – driven by pride, a love of game and a burning desire to prove the foolish bigots wrong. Baseball, once again, has something to prove. The All-Star game at Citi Field, bookended by the coming of New York Mets fireballer Matt Harvey and the solo victory lap of Yankees fireman Mariano Rivera, helped fans forget about the game’s latest troubles, at least for one night. The July 16th contest also provided showcases for Detroit Tigers Triple Crown winner Miguel Cabrera and Baltimore Orioles slugger Chris Davis, who gave the quote of the season when he declared the real season home run record is the 61 dingers slammed by Roger Maris in 1961. Thanks to this latest, perhaps most disheartening doping scandal of them of all, it might be too late to ever fully restore fans’ faith. Sadly, we can believe everything we’re reading about Rodriguez, who once showed the potential to become the best to ever play the game. But the even sadder truth is we can’t always believe everything we’re seeing on the field.